Are virtual book tours worth it? I have many people asking if a virtual book tour is worth it. I mean, what they are really asking is will they make sales? To make those sales the authors want and expect to happen, he/she must put in their 100%. That’s the only way unless you luck out and get on Oprah, but still the work continues. Marta Stephens just finished up her virtual book tour for her book, The Devil Can Wait. Read what was involved for her and how you can learn by example the next time you want to go on a virtual book tour. Marta’s guest post “Are virtual book tours worth it?” can be found at Book Marketing Buzz! Richard Roach, author of the suspense/mystery novel, SCATTERED LEAVES, will be stopping off at The Dark Phantom on Day Thirty of his virtual book tour with Pump Up Your Book Promotion! SCATTERED LEAVES VIRTUAL BOOK TOUR ‘08 will officially begin on Nov. 3, 2008 and end on Jan. 30, 2009. You can visit Richard’s tour stops at www.virtualbooktours.wordpress.com in November to find out more about him and his new book! Vivian Eisenecher, author of the self-help book for alcohol addiction, Recovering Me, Discovering Joy: Uplifting Wisdom for Everyday Greatness, will be stopping off at The Writer’s Life on Day 13 of her virtual book tour with Pump Up Your Book Promotion! Recovering Me, Discovering Joy reveals how to recover (from any ailment or condition) not to normal but to a better normal. After numerous attempts at sobriety, stints in more than three rehabs, followed by repeated relapses, Vivian shares the “secret” that finally brought her lasting recovery and profoundly changed her life. In an effort to improve the success rate of recovery and quite possibly save lives, one of the book’s main goals is to raise awareness about the profound correlation between depression, social anxiety, and alcoholism. Vivian has struggled with these disorders and is in recovery from all three. You can visit her website at www.recoveringme.com. 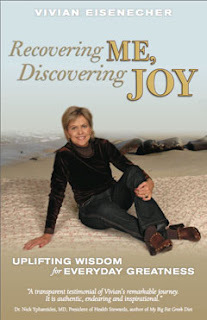 RECOVERING ME DISCOVERING JOY VIRTUAL BOOK TOUR ‘08 will officially begin on Jan. 5, 2009 and end on Jan. 30, 2009. You can visit Vivian’s tour stops at www.virtualbooktours.wordpress.com in January to find out where else she’ll be touring! Maggie Rose Crane, author of the self-help book for boomer women, Amazing Grays: A Woman’s Guide to Making the Next 50 the Best 50, will be stopping off at Blog Talk Radio with Kim Smith on Day 10 of her virtual book tour with Pump Up Your Book Promotion! Balanced somewhere between a memoir and a how-to, Maggie uses her personal journey as a springboard to shatter stereotypes about aging. She shares her most poignant insights and experiences on what it means to be a woman “of a certain age,” and offers suggestions on how to mindfully chart a graceful course through the physical changes, emotional challenges and mental gauntlet of aging. With honesty, humor and plenty of research, Maggie lights the way for women who want to live with vibrancy and joy – regardless of their hair color! You can visit her website at www.maggiecrane.com. AMAZING GRAYS VIRTUAL BOOK TOUR ‘08 will officially begin on Jan. 3, 2009 and end on Jan. 30, 2009. You can visit Maggie’s tour stops at www.virtualbooktours.wordpress.com in January to find out where else she’ll be touring! William Petrick, author of the contemporary fiction novel, THE FIVE LOST DAYS, will be stopping off at Literature Chick on Day 24 of his virtual book tour with Pump Up Your Book Promotion! THE FIVE LOST DAYS VIRTUAL BOOK TOUR ‘08 will officially begin on Dec. 1, 2008 and end on Jan. 30, 2009. You can visit William’s tour stops at www.virtualbooktours.wordpress.com in December to find out where else he’ll be touring! Vivian Eisenecher, author of the self-help book for alcohol addiction, Recovering Me, Discovering Joy: Uplifting Wisdom for Everyday Greatness, will be stopping off at The Book Connection on Day 8 of her virtual book tour with Pump Up Your Book Promotion! Maggie Rose Crane, author of the self-help book for boomer women, Amazing Grays: A Woman’s Guide to Making the Next 50 the Best 50, will be stopping off at Zensanity on Day 8 of her virtual book tour with Pump Up Your Book Promotion!